Jumping into the new year with some winter beauties. Spring 2015 was great! After the harsh winter, our trees put on a glorious show in celebration of spring. Gorgeous new trees ready for planting! 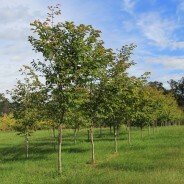 We are excited to bring you new tree selections from our fields. Check them out! 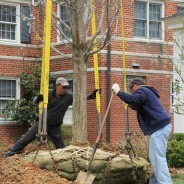 Twenty Images of an 8" caliper Red Maple tree with 90" rootball installed with a crane. 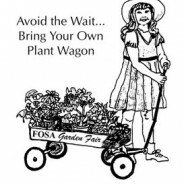 Watch Shade Tree Farm move and transplant fully grown, 25' tall trees at Blandy Experimental Farm this Mother's Day Weekend. Cheerful pink flowers of our native Redbud announce spring in style. They are often seen in drifts along woodland edges or sprinkled under the canopy of an older forest. 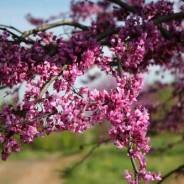 Redbuds are beautiful, easy to grow small flowering trees and make wonderful additions to the home landscape. 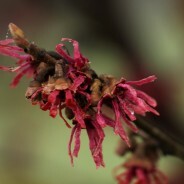 Looking for a gorgeous small flowering tree that is low on maintenance and easy to grow? 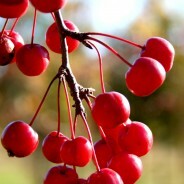 Crabapples just might be the ticket! 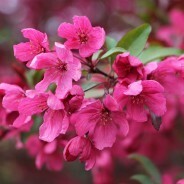 They are ornamental gems in the landscape and are attractive throughout the year. 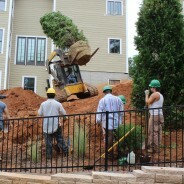 Twenty-two eighteen foot tall Arborvitae are planted in a residential development creating an instant green landscape screen in Northern Virginia.